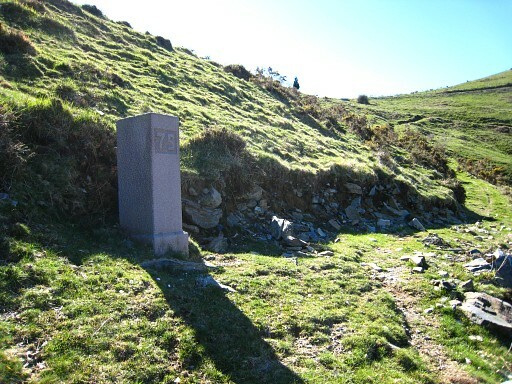 Picture of the previous bordermarker, lying flat besides the new marker. 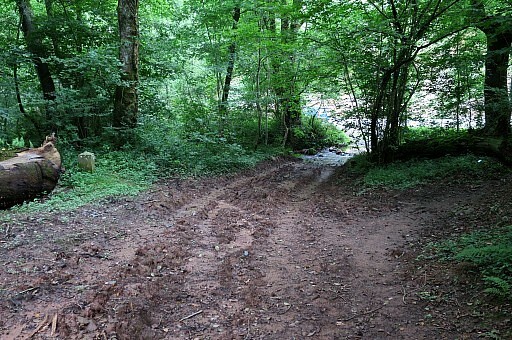 In 2013, Jacques Koleck found back the old bm in the stream next to the new bm. It was broken in two vertical halfs. The part that was left, contained no inscription. Sizes: 23x36x93cm + base. 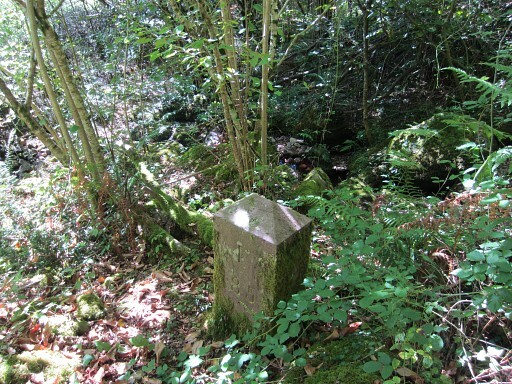 Just beneath the Col de Gorospil (with bm075 and 76) at the source of a stream, there's a peculiar "cemetary" of former markers 75 and 76. 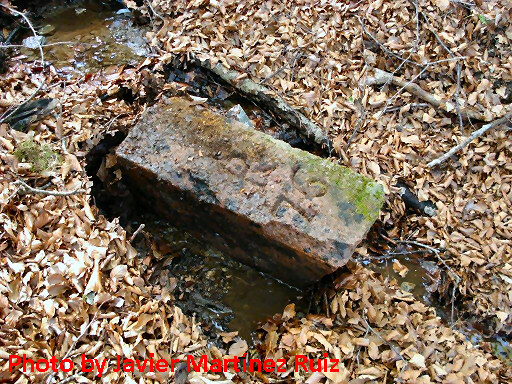 It appears that both bm075 and 076 were easy subjects for vandalism. 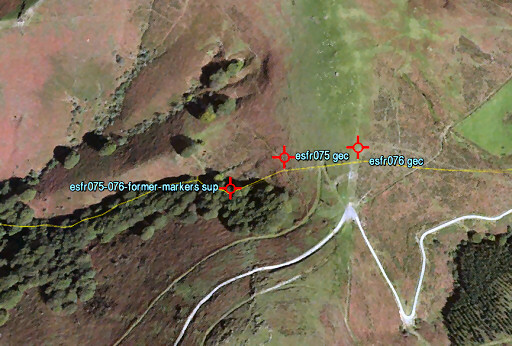 We can extract from this article the misadventures of bm075 and 076. 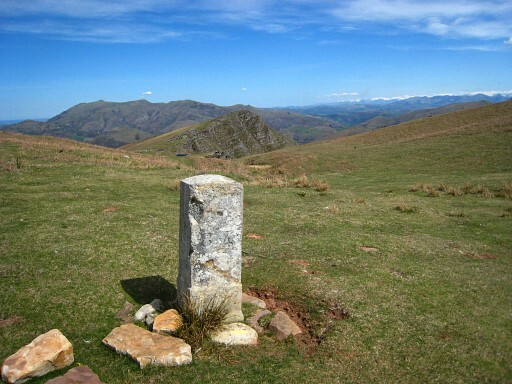 Their history can be traced by the regular bordermarker-surveys of the communities of Baztan and l'Espelette. 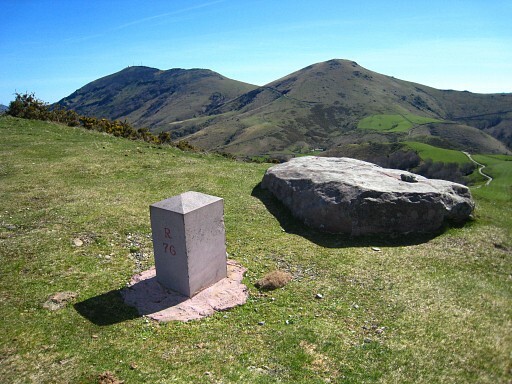 From 1948 onwards, problems began with the markers 75 and 76. But let's start in 1787. 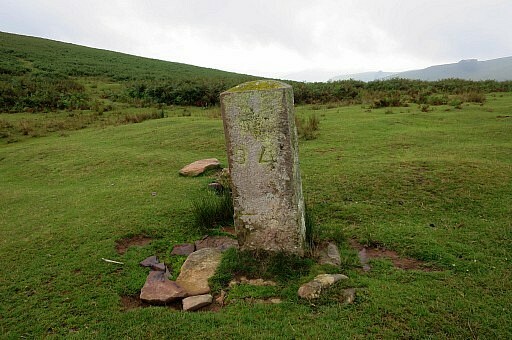 1787: the first markers 75 and 76 were placed. 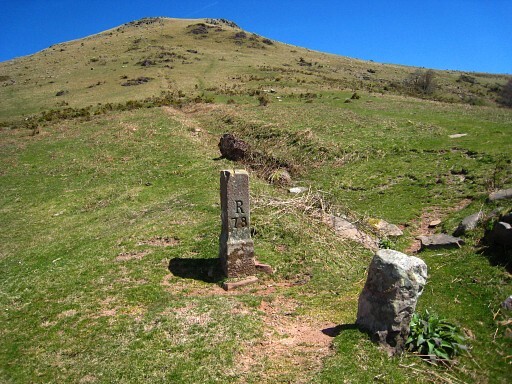 These were part of the range of very first numbered bordermarkers (with a capital R above the number), ordered by the Commission Caro d'Ornano. See the history page. 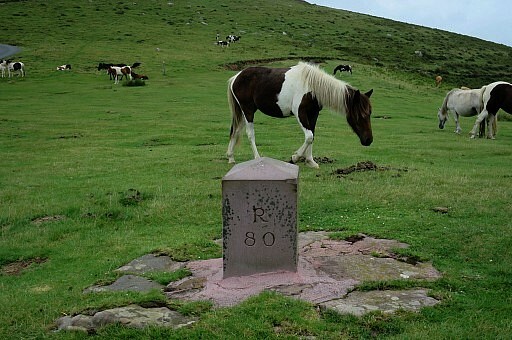 No.76 came next to the ancient monolith and no. 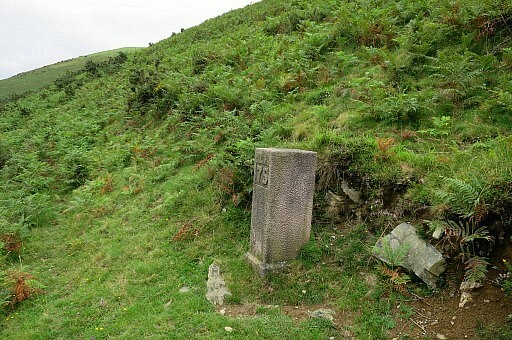 75 next to an ancient small rock which served as as a bordermarker before. 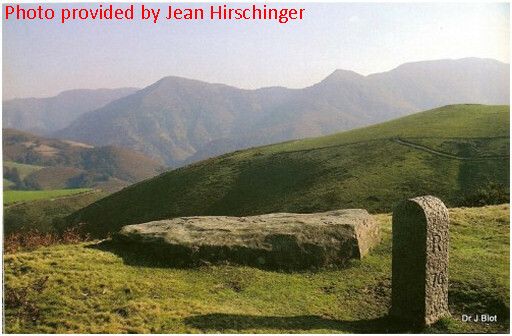 Between that small rock and the monolith was a corridor for letting French flocks of Espelette on to the pastures of Baztan. That explains why nr. 75 and 76 are so close. 1958: they have both disappeared or perhaps they haven't been replaced yet. 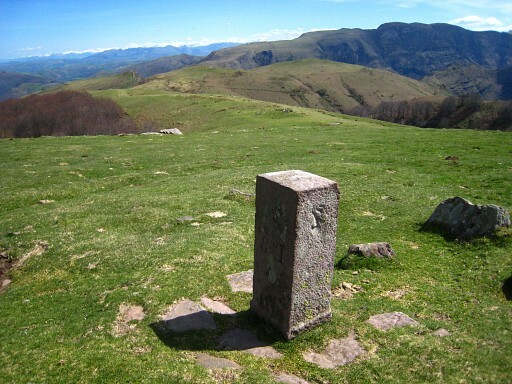 1997: both markers (among others) are destroyed in a terrorist attack (how brave) of Bask separatists. We have pictures of bm076, shattered to pieces. 1998 (probably): they were replaced again by new ones, a helicopter was needed. These are the ones with their pyramid top and the smooth surface. This is the third or fourth generation. 2000: these new ones were found destroyed and/or thrown down the hill. 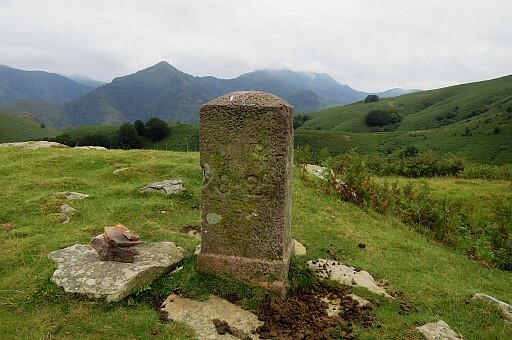 They were - according to the inspection report of Baztan-l'Espelette - replaced the same year. We're almost loosing track of the successive generations: these replacements must be the fourth or fifth generation. 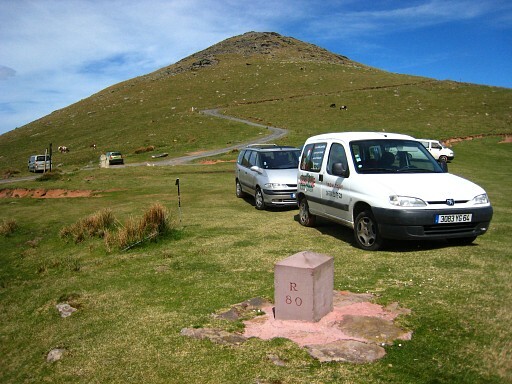 after 2003: bm075 is replaced by the current marker which makes it the fifth of sixth generation of bm075. As said: I received pictures and information in 2013 and 2014 of Jacques Koleck, Javier Martínez and Anne Marie Bats & Bernadette Chasseur. Let's combine their information. 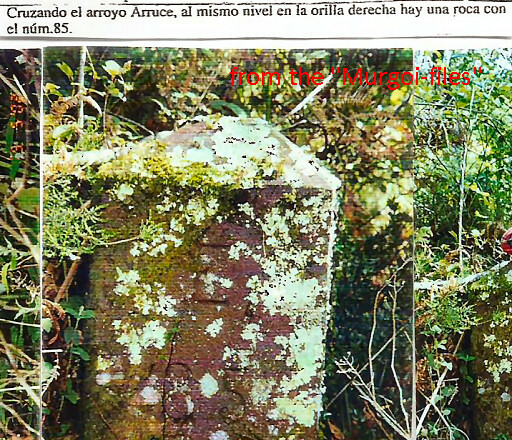 A first conclusion from Jacques: there are in fact two cemetaries: an eastern one (± 50 m from bm075) and ± 60m downstream a western one. 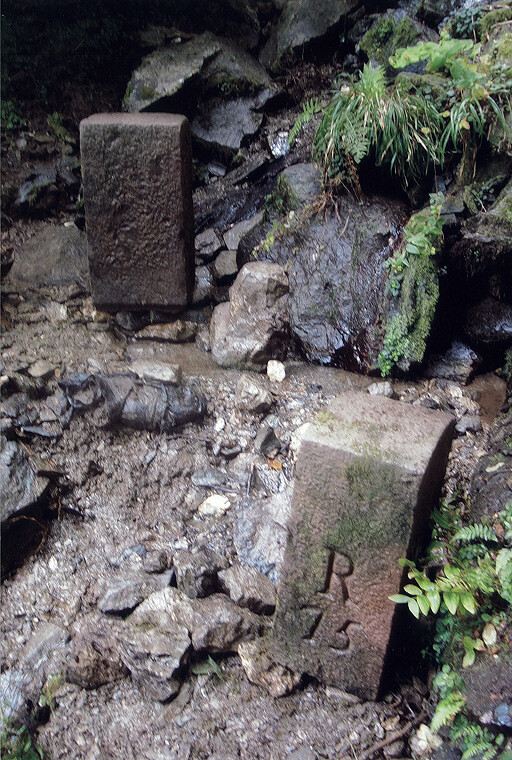 On june 30th 2013, Jaques Koleck discovered ± 50 meters downhill from bm075 the former pillars 076 and (possibly) 075, both buried in the gravel of the stream of Haizagerrico, next to each other. From above from the current bm075, the spot of this cemetery is easy to see according to Jacques: where a huge uprooted beech tree lies flat. 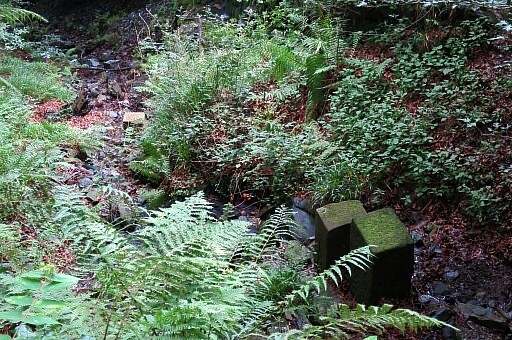 - the first one lying in the streambed in the open air. 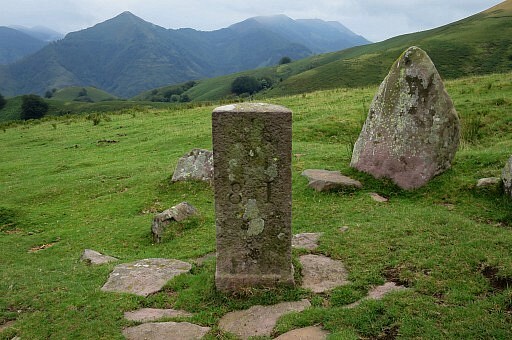 No engravings, Jacques supposes that this is a submarker. The second and third one in close-up. 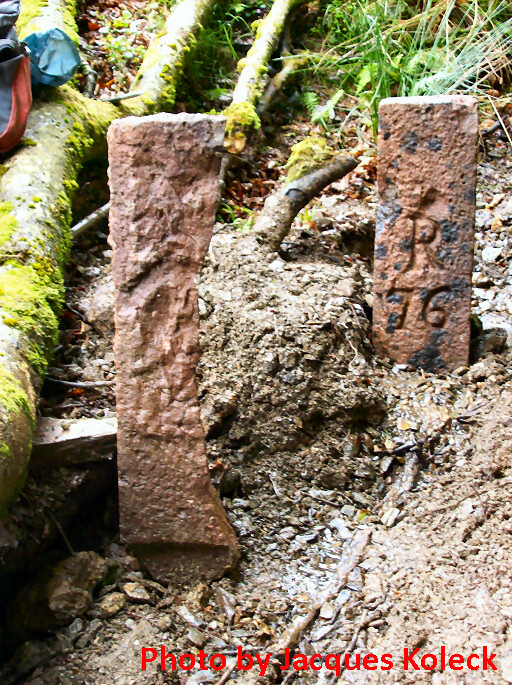 We can see that the 76-marker is the first generation of bm76 (because of the R, engraved just above the number). 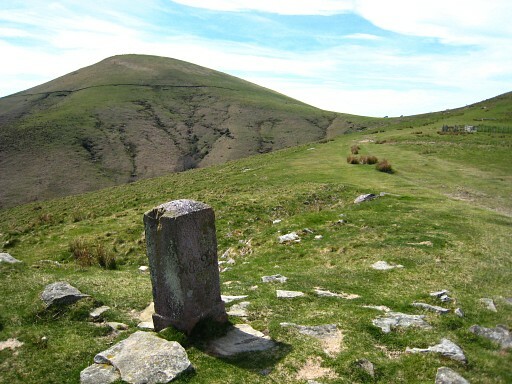 Pushed down the hill around 1948. 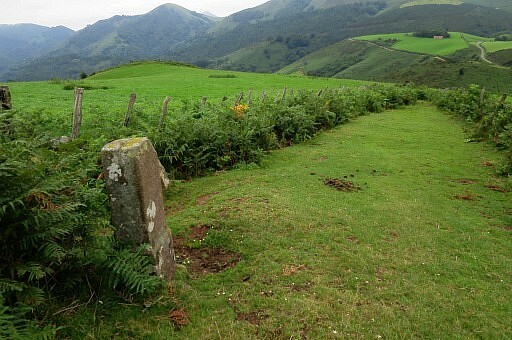 Shortly after Jacques' discovery, Javier Martínez Ruiz surprised me with the pictures of his exploration in 2007 of this cemetary of bordermarkers. This nr. 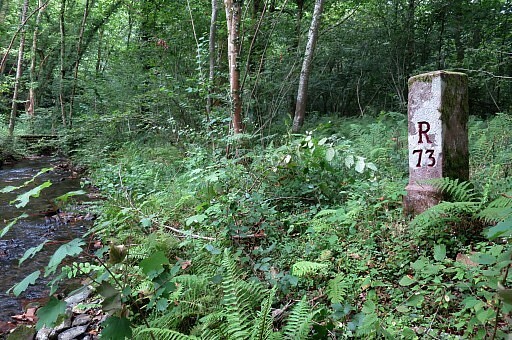 76 must be the same as the one found by Jacques Koleck. 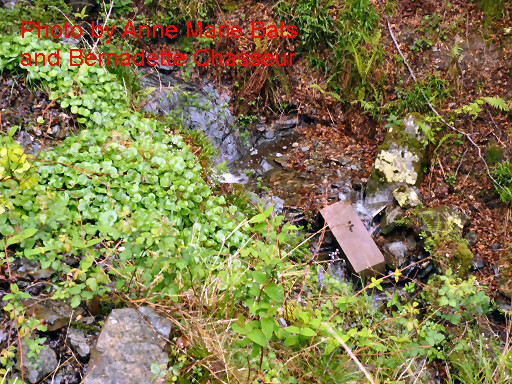 In spring 2014 Anne Marie Bats and Bernadette Chasseur also visited the 'cemetary'. They made this picture of what they called "bornes alignées". 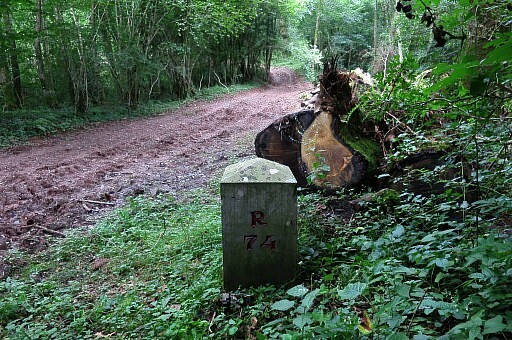 I think these are the nr 76 and the vertically split marker which Jacques Koleck shows. are further downstream than Jacques' markers. This must be the first generation of bm075, pushed down the hill around 1948. This is the second nr. 75 in the cemetary. 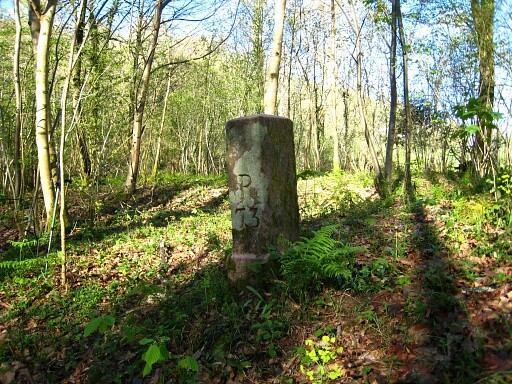 This type of marker was placed 'in situ' around 1998 (together with a new bm076) and both found destroyed in 2000, being replaced the same year by new ones (I suppose indentical ones). Bm076 survives until now but bm075 was thrown downhill in 2000-2003 and replaced by the current one afterwards. 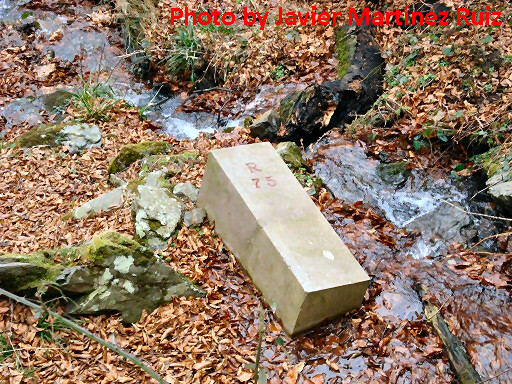 In particular they refound the two bordermarkes 75 which Javier Martínez shows on his pictures above. A zoom-in from previous picture. We can see the nr. 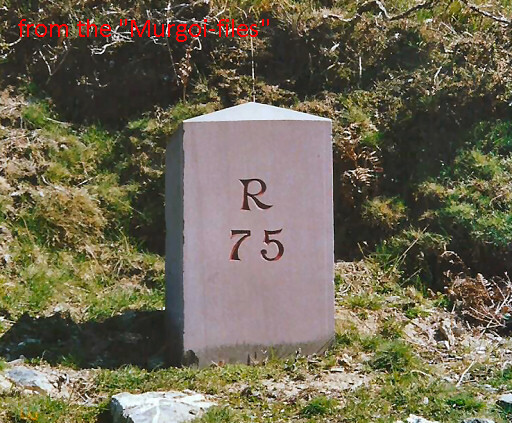 75 in de lower part of the picture and in the upper right corner nr 75 (it's number is on its shadowed side and not visible here but readable on the original picture). Nr 75 seen from a different spot. 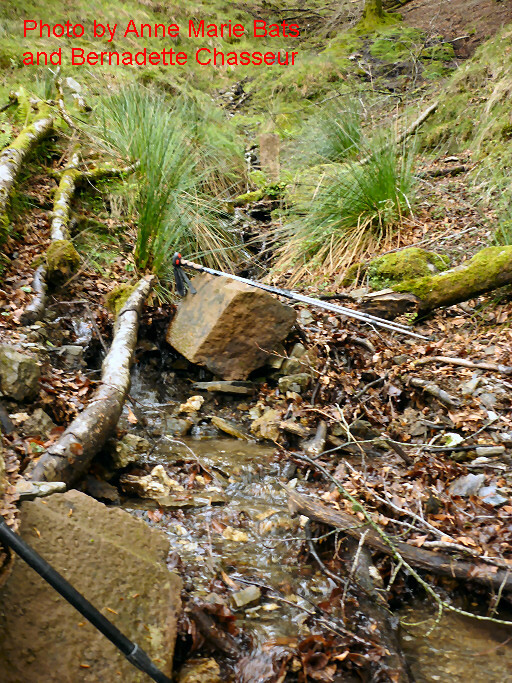 The terrain was too wet and slippery for Anne Marie and Bernadette to get closer. 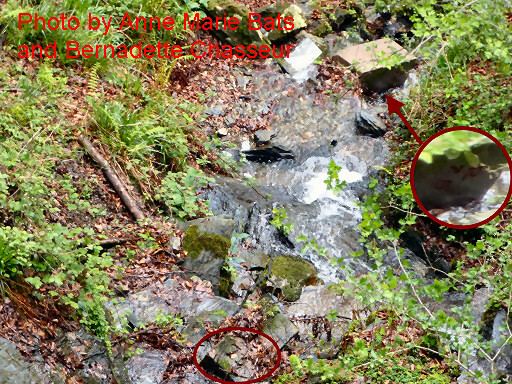 In august 2014, Jacques Koleck returned to investigate the spot where Anne Marie and Bernadette (and in 2007 Javier) had found the two bordermarkers 75. 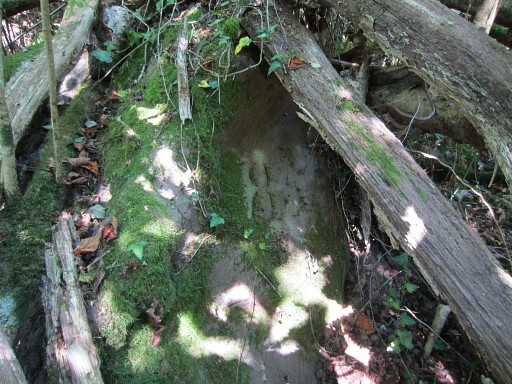 And he found a third marker (this picture) with no engravings, 4m upstream of the old bm075. 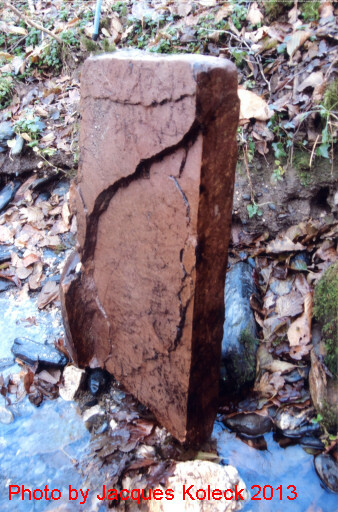 "une borne en grès rouge, sans inscriptions, en parfait état, dimensions : 34 x 45,5 x 89 cm (masse estimée : 380 kg ! 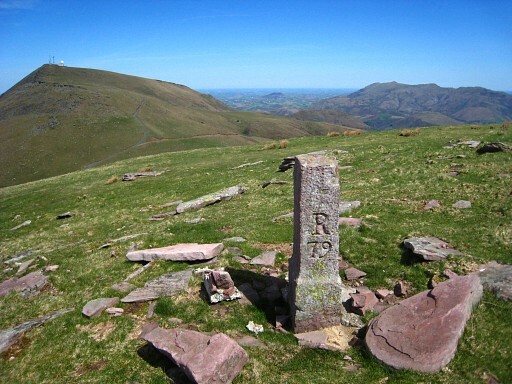 ), base évasée, travaillée au ciseau, sommet plat"
Jacques' description of the R75: "4 mètres plus bas , une ancienne borne en grès rouge portant l'inscription R 75, dimensions : 30 x 38,5 x 64 cm, base plane et sommet arrondi"
Jacques also descended the 6m to the brandnew-looking bm075. 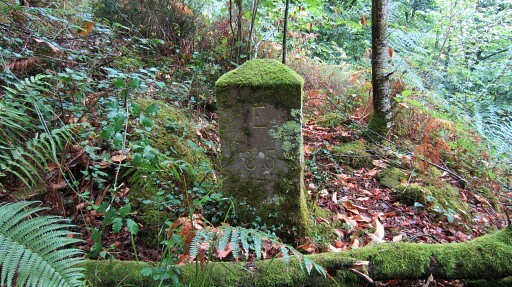 "6 mètres plus bas: une borne en grès rouge, lisse, paraissant presque neuve et portant l'inscription R 75, dimensions : 30 x 35 x 91 cm, base plane et sommet pseudo-pyramidal avec une arête sommitale de 10 cm"
- there are two cemetaries: a eastern one (± 50 m from bm075) and ± 60m downstream a western one. - the eastern one (upper one) contains an old (original) bm076 and an un-engraved marker and one marker cut in half. 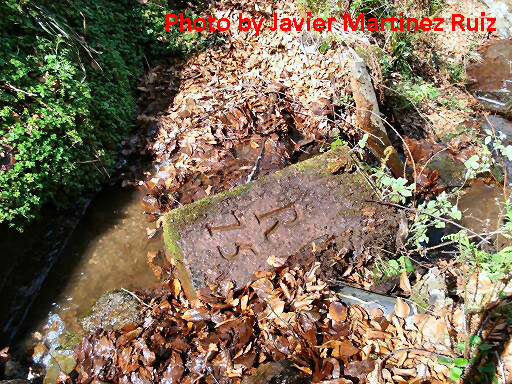 Between this cemetary and bm075 is the source/beginning of the stream. - the western one (lower one) contains an old (original) bm075 and a brandnew-looking bm075 ánd an un-engraved marker. 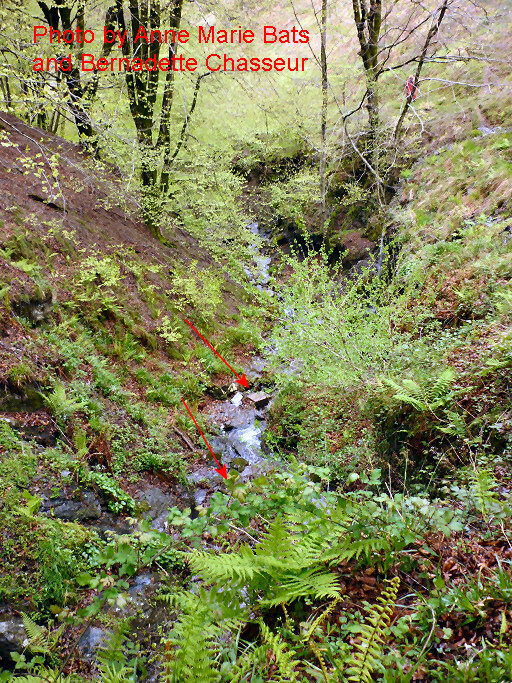 It's close to a source and little cascade on the right bank of the stream. 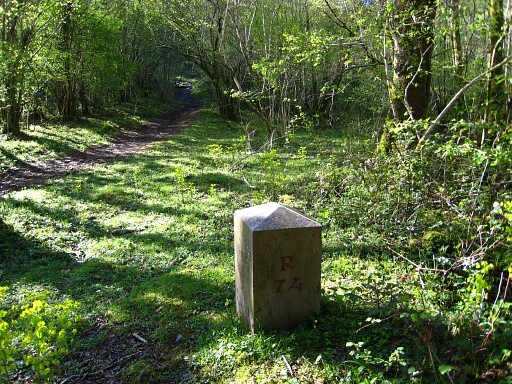 - between those cemetaries, a small trail passes the border and - according to Jacques - that's the spot where the Treaty allows cattle to be led onto Spanish territory for up to 5km. 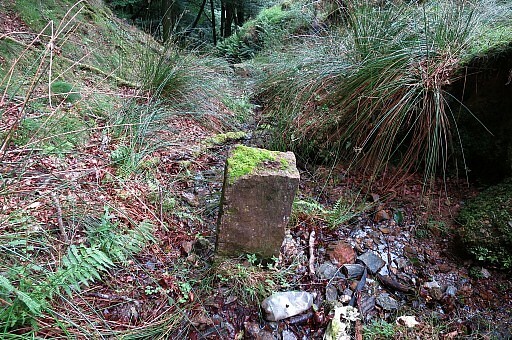 - hypothesis of Jacques: the two or three un-engraveded markers were placed to mark the stream which is the borderline. Why? 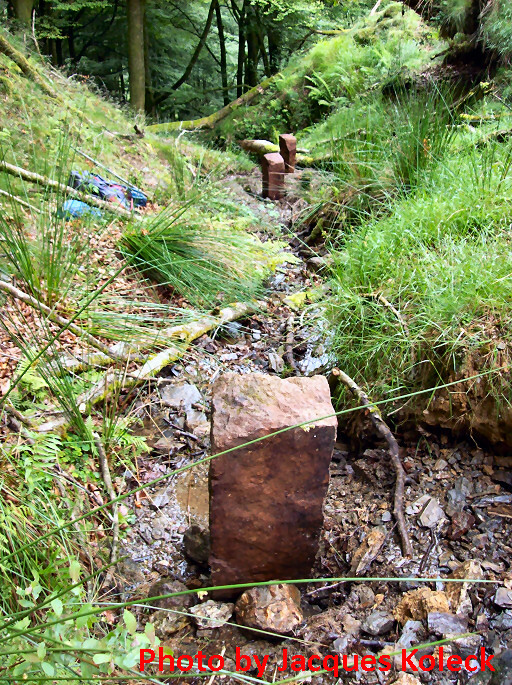 Because there is another stream springing nearby which merges with the borderstream where the trail crosses the border. 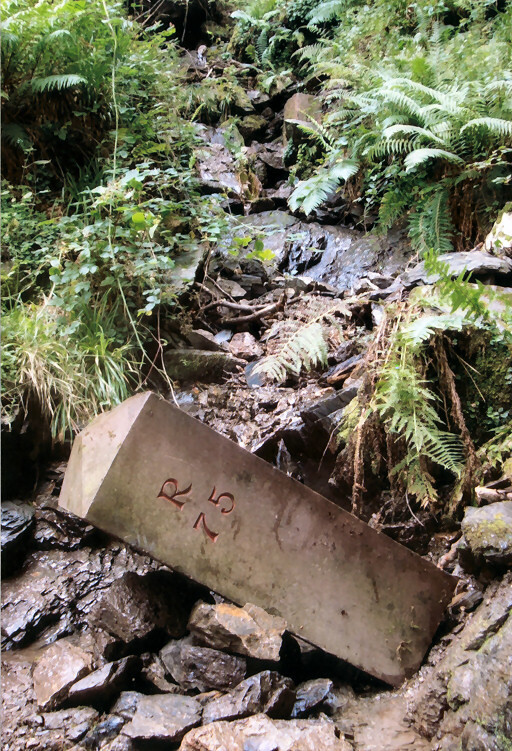 Picture of a previous version of bm075, still 'in situ'. 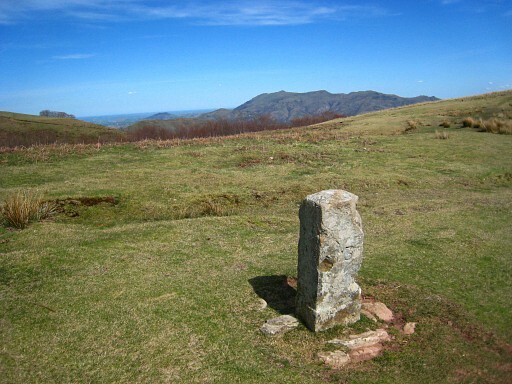 It was installed around 2000 but pushed down the hill in 2000-2003. 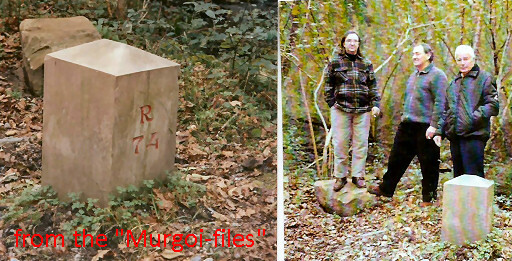 Old picture of bm076, provided by Jean Hirschinger. It seems that one "Dr J Biot" was the photographer. 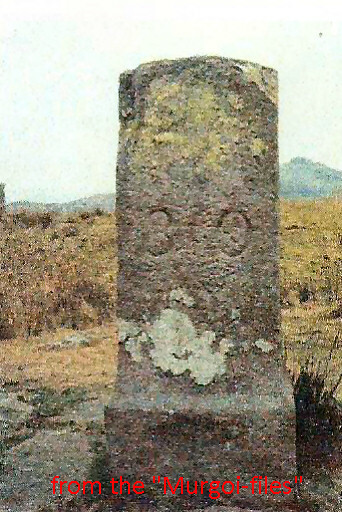 This one was installed around 1960. 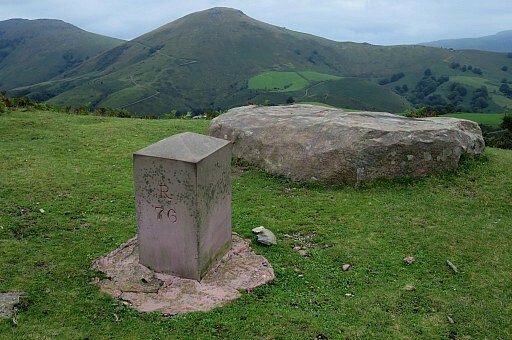 Note the rounded top and the distance between the R and the number 76. Another old picture of an old version of bm076. 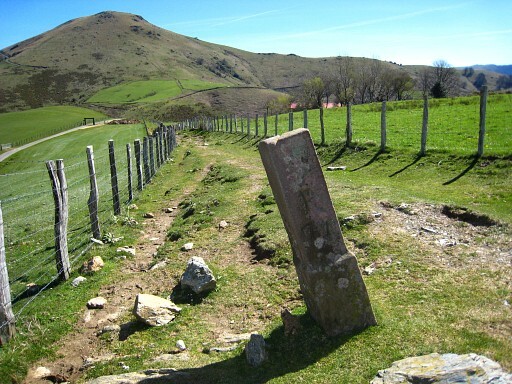 And here we see the same bordermarker but now destroyed by Bask separatists in 1998. It's still the one, installed in 2000. 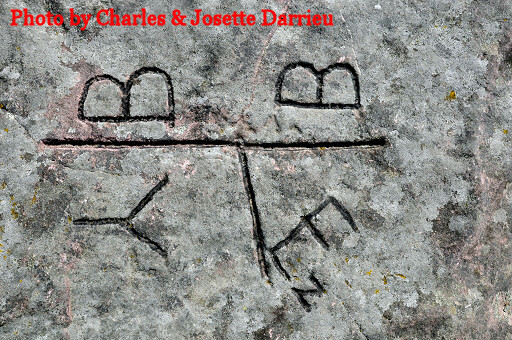 Charles Darrieu provided this close-up of the engravings on that rock and a citation of Jean Sermet from his "La Frontière des Pyrénées" . 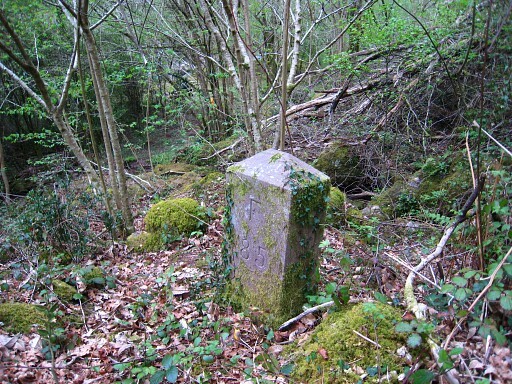 It tells that it's date of origin is unknown but in any case pre-1858. 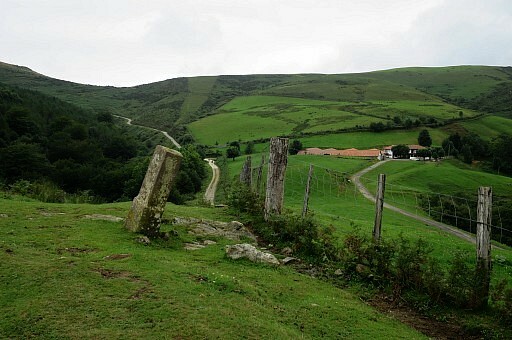 BB comes from Valle de Bastán (Spain), Y and Ez from the French communities of Itxassou and Espelette. 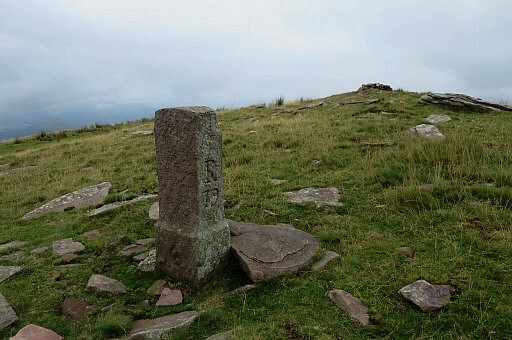 Picture of the original bm080. 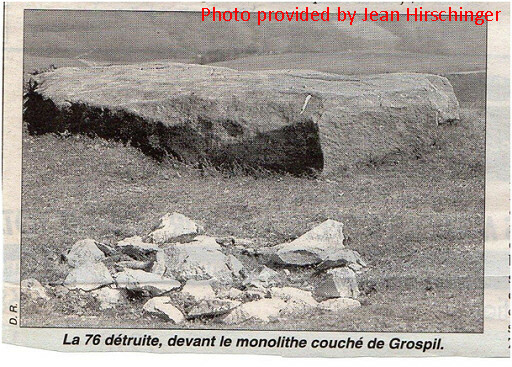 In march 2014 I have been informed by Robert Darrieumerlou that this picture originates from his website (this page). The photographer was one "Xan". 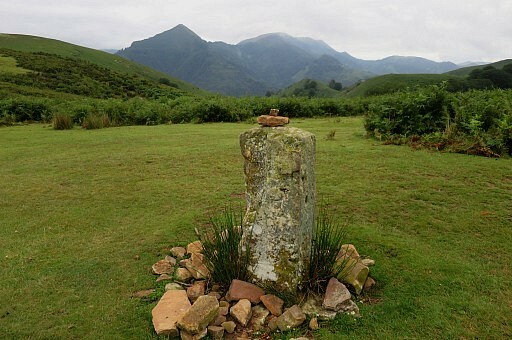 Bm081 is surrounded by a circle of stones vertically implanted, a so-called Cromlech, a megalitic monument. 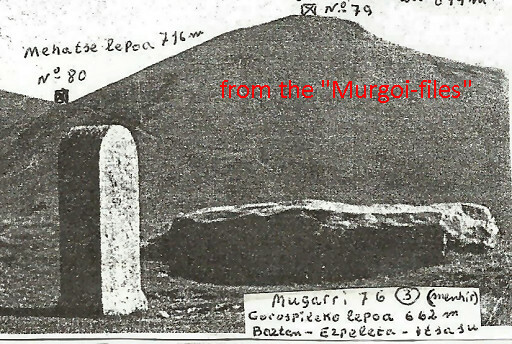 Interesting on this picture from "The Murgoi-files": the referral in the text to the second number 85 on the other side of the stream. And I was informed by Charles Darrieu of the existence of this extra number.